Sabin and Edgar are two of my favorite characters in FFVI, mostly because of Edgar’s shameless flirting and Sabin suplexing trains. However, it’s like they are competing with each other for worst hair in the series. Buzz cut gone awry plus a rat tail? Super long ponytail with two ribbons? Dial it back brothers. Two brothers that look like they’re from different worlds. Fable vs Street Fighter? Heath Ledger in The Patriot vs Dolph Lundgren in Rocky 4. Edgar brings the class with two bows, while Sabin’s rattail looks ready to bust some skulls. 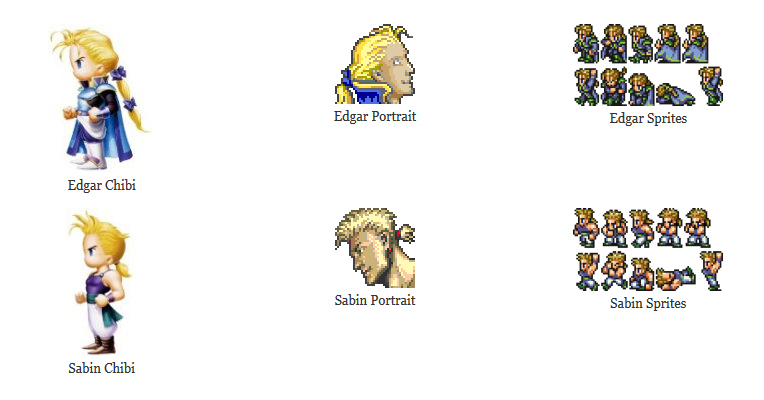 Love Edgar, but his portrait is always a little “creepy Lestat.” And Sabin looks about a decade older despite being the younger twin, thanks to weird gray skin tint. Too much time in the mountains? However, Edgar pulls off the totally unnecessary double bows and Sabin can certainly rock a purple muscle tank. Oh my god, “creepy Lestat” is a perfect description for Edgar. I don’t know why I didn’t see this before, but Sabin is definitely dressed like Aladdin. Sure, it’s a fierce tank instead of an open vest, but really all he needs is a little monkey friend. While both are stylish, I’m partial to Edgar’s full blown regalia. You’ve given me more appreciation for Sabin by pointing out the Aladdin resemblance. I do like the pants and scarf/belt combo. Very martial arts. Meanwhile comparing Edgar to a vampire has ruined him in my eyes. Well done Jillian. Also FFVI lovers=Twilight Fans now. Sabin’s a little too beefy for me to really view him as scrawny starving street rat Aladdin, but the scarf/belt does bring up memories of Arabian Nights. His sprite hairstyle is totally Bad Dudes, though. I won’t apologize for Edgar-vampire. He’s a total ladies man and he lives in a castle that can burrow underground, basically a giant stone coffin. Also, he kills people with chainsaws while wearing double-bows, so extra credit there.